With the rise of mobile games using the smartphone, there have been attempts to incorporate tactile buttons for a more precise gaming such as adding transparent stickers on the screen. A Kickstarter project plans to give any smartphone–whether it is the Samsung Galaxy S3, the iPhone, or any other Android handset–the look and feel of playing with a handheld gaming device. A creation by Harvard drop-outs Connor Zwick and Colton Gyulay, the Coco Controller has already received backing from seed accelerator Y Combinator to the tune of $150,000 worth of convertible bonds. 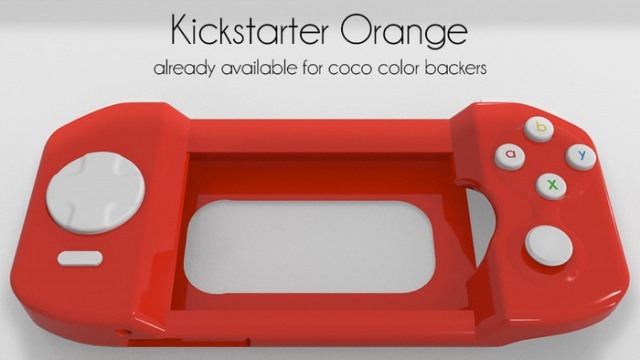 The Kickstarter project, meanwhile, is hoping to raise $175,000 to manufacture and distribute the controllers. They have raised about $18,200 as of this posting with 27 days to go. A black or white Coco will cost $42, while a color Coco will cost $50. Coco feature all the physical buttons seen in handheld gaming devices, including an analog stick and a directional pad. It can be played on any mobile game that would require a joystick, not just arcade games. The analog stick is low-profile yet comfortable to use, while the directional pad is capable of eight directions.